This is yet another stunning leg of the walk. It can be accomplished by strong walkers in a day, but others might choose to break it up. Beware the sting in the tail - the last section in the shadow of Beinn Eighe is spectacular, but very rough. It is suggested as the main route because of the quality of the country around Beinn Eighe, but there are several options to make this leg easier (see route alternatives). Things start out gently enough as you wind along the river Carron on a new path created for fishermen, passing the various beats. This brings you to within a stone's throw of Coulags where you head north east, following the Fionn abhainn river. You'll pass a well kept bothy (Coire Fionnaraich NG 950 480) as you ascend past Loch Coire Fionnaraich and contour to Bealach Ban where there's the odd, rough wild camping spot. From here you descend on a reasonable stalker's path into the majestic Glen Torridon passing the famous Ling Hut (a private climbers' place) and crossing the A896. In bad weather conditions this could provide an escape route into Kinlochewe. There are good camping spots by the river just over the road. The going gets steadily tougher as you climb into Coire Dubh Mor and contour round Sail Mhor. There is a rough track, but this gradually peters out leaving you to enjoy some real wilderness. It's really rough going until you reach the pass that takes you down towards Kinlochewe, but there are superb, unspoilt views of the wonderful glens all around you - this is Torridon proper and for me really is one of the highlights of the trail. It'll be a stern test, but then isn't that what you came for? Try to follow the 400m contour and beware of dropping too low as this will lead you into some really rough, boggy ground. You'll pass near to the place where in March 1951 a Lancaster bomber crashed near the summit of Beinn Eighe. All eight crew from RAF Kinloss died. Difficulties in recovering the bodies led to the formation of RAF Mountain Rescue which exists to this day. A small brass plaque on part of the wreckage commemorates the accident and the area is known as Fuselage Gully. In a strange twist to the story in 2008, a climber's fall during an avalanche was broken by a propeller from the plane, he was injured but survived the incident. After descending from the pass, a pleasant forest track offers you some respite and takes you into Kinlochewe where there are some good amenities - a shop, cafe and post office as well as a campsite and bunkhouse. The main route alternative on this leg is via Achnashellach. To access this alternative, you'll either need to use the route alternative described in the previous leg (via Craig), or continue along the A890 past Coulags to Achnashellach. From Achnashellach the route heads north towards Beinn Liath Mhor, down the idyllic Easan Dorcha (where there is a small hut / bothy) and north east to Torran Cuilinn. From there, a climb through the forest and over Carn Dhomnhuill Mhic a Ghobha takes you on a steady descent to Kinlochewe, through an area of felled forest, finishing along the river (although the last few km are rather overgrown and a frustrating way to finish the day). This alternative is easier than the main route, so could be a good choice in bad conditions or if legs are suffering. It can be made even easier by taking the 4x4 track due north to the Couilin Pass and onwards to Torrann Cuilinn. This can be accessed either from Achnashellach or via a rough track that leads up from the road beyond Craig. 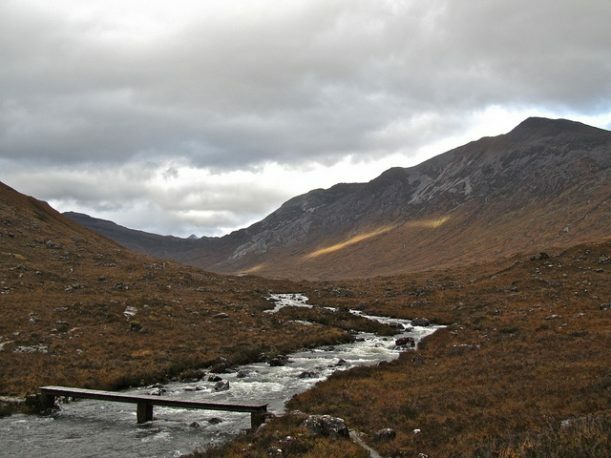 A further alternative is to follow the main route from Coulags up and over Bealach Ban, but instead of descending all the way to the road, branch off north east, skirting round Sgorr nan Lochan Uanie and descending to pick up a path at Coir an Leth-uillt. This takes you to Couilin Lodge from where a 4x4 track heads south east for a couple of kilometres to intersect the main Achnashellach alternative described above.